I rode the train to Kodomonokuni station one Saturday a month to teach English to a delightful group of Japanese women who lived just a short walk from the station. I remember the train being filled with lots of children and families wearing backpacks ready for a day outdoors. I knew there was a park nearby but didn't give it much thought. 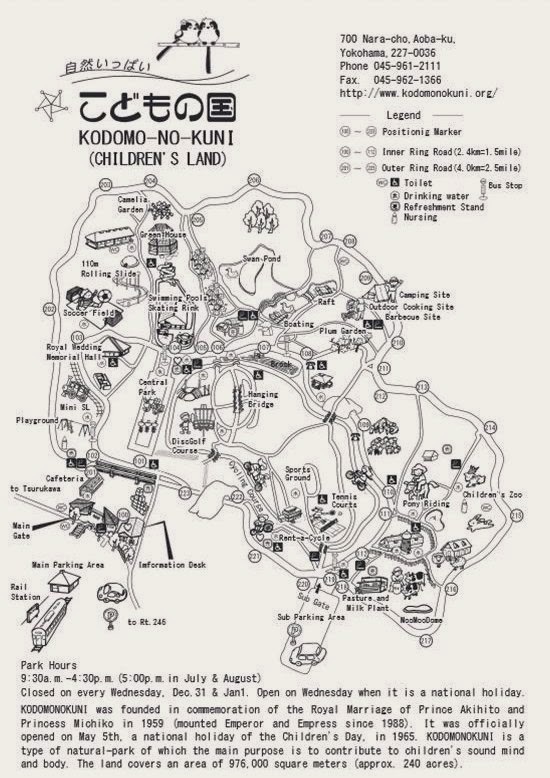 A friend posted this link about a park I "had to visit" I finally connected Kodomonokuni Park with the one I walked by as an English teach. I never would have suspected its magnitude or that my kids would be riding that same train five years later. Grandma and Grandpa spent the day with the kids exploring the park while I finished up last minute preparations for Baby B's arrival. This park has something for every kid to enjoy. Even just kids at heart. The park is massive and although many visitors seem to be entering the park they quickly disappear into the vast landscape. Petting animals at the petting zoo. And getting to hold them. Identifying birds in the aviary. And finding places along the way to relax and take pictures. Grandma was on a search for early cherry blossoms and the kids were excited to help her find some. They finished the day in true grandparent style. A cone for each kid. And then it was naps on the train ride home. I'm thrilled to know of this fabulous park within a 30 minute train ride of our house. I have a feeling we are going to know the route well!